Following the release of her debut album as a signed artist and a song used by iTunes for one of their Singles of the Week – which has previously been home to the likes of Jake Bugg, The Vaccines and Bastille – female folk artist Valerie June has come to Dingwalls to perform an intimate gig to a handful of fans. Newly signed artist, Valerie June, performs at Dingwalls. June is immediately striking as she comes onstage, stunningly attractive with a mass of dreadlocked hair. Her entrance elicits applause, of course, but also a hushed appreciation of this natural beauty. She looks like what would have happened if Beyoncé had picked up a banjo after Destiny’s Child instead of a pair of stilettos. The similarity does not extend to their vocals. Though June does have an impressive voice that can portray a wide range of emotion, it sounds like nearly every other female folk musician around. It is her songs that make her stand out from the crowd. Her debut album, Pushin’ Against a Stone, was co-written and produced by Dan Auerbach of The Black Keys and you can hear his influence in the songs played tonight. Her recent single, You Can’t Be Told, sounds like it could easily have been taken from The Black Keys’ back catalogue with its guitar riffs and foggy vocals. The other single, Wanna Be on Your Mind, is probably June’s most well-known and the audience start to sing along. However, the highlight of the set is her performance of title track, Pushin’ against a Stone. With its wide range of vocals and epic buzzsaw guitar riff outro it brings the stage alive. It also shows off June’s ability as a lyricist as well as a vocalist. This show is the beginning of the rise of Valerie June: folk music has a new female figurehead. A hard title to maintain but with her performance at Dingwalls setting an exceptional standard perhaps June will be able to hold on to it for a long while. 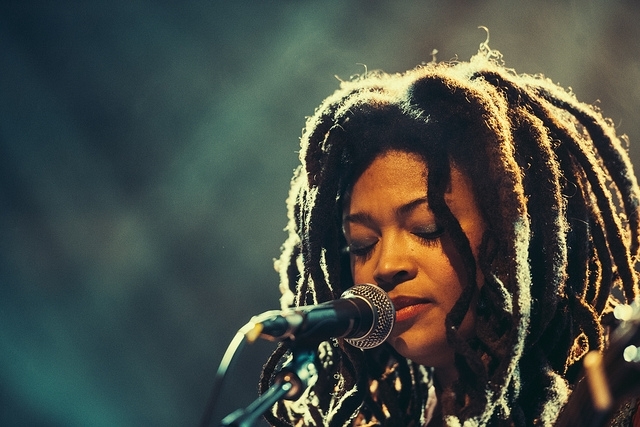 For further information about Valerie June and future events visit here.